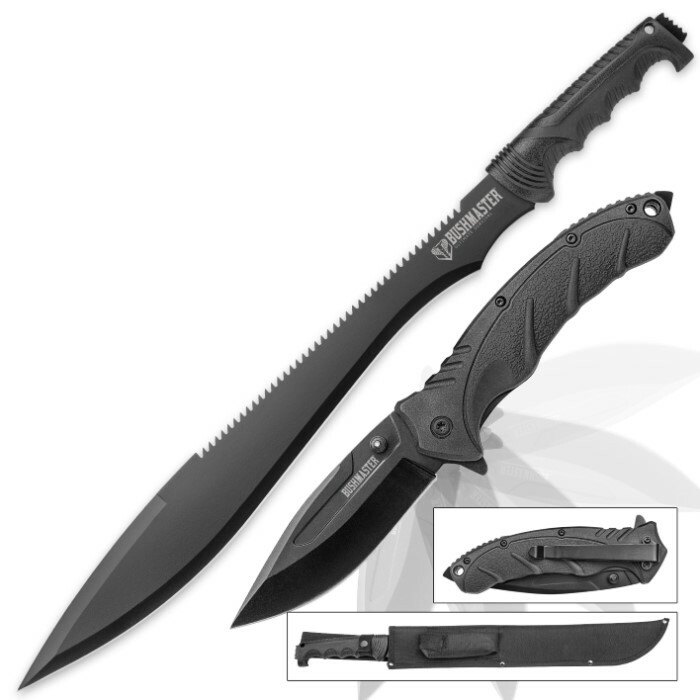 Machete: barong style; big, powerful and rugged; features versatility-enhancing serrated "sawback"
No matter the terrain, no matter the locale, no matter the conditions, with the Bushmaster “Cobra Strike” 2-Piece Tactical Knife Set leading the way, you can pierce the impenetrable, cleave the indivisible and hack apart the indestructible. 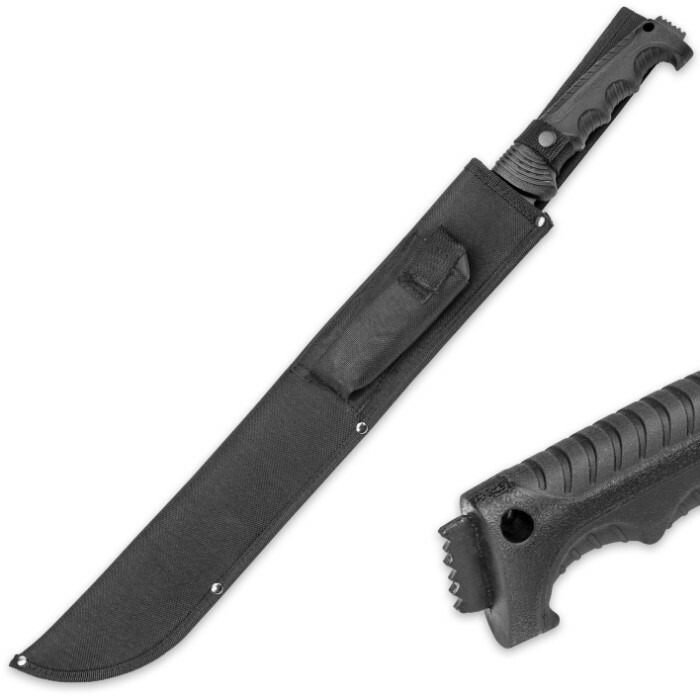 This powerhouse duo boasts myriad capabilities and affords countless cutting options via two capable knives - a hefty “barong" style sawback machete and a convenient, versatile assisted opening folder. 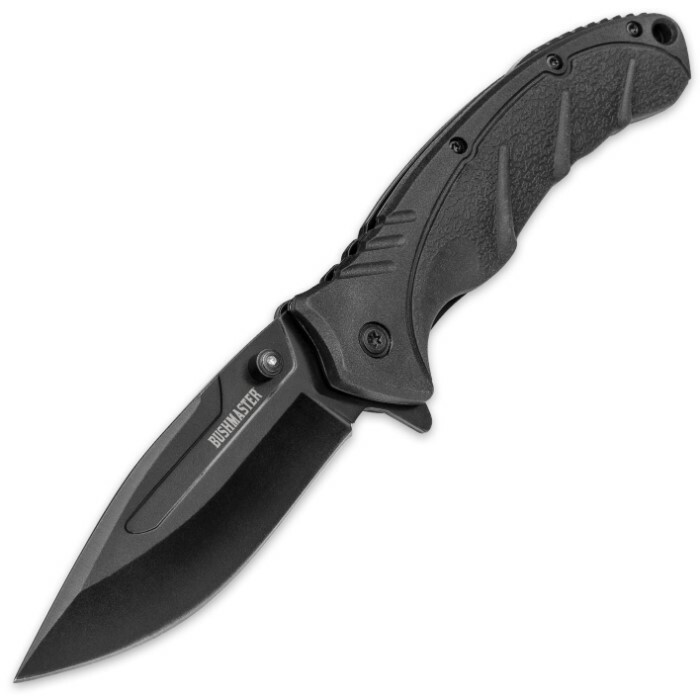 Both knives feature stainless steel blades with rugged black coatings, paired with a heavy duty molded handles. Each blade is razor sharp and robust, and both handles are carefully formed to yield sleek lines, fluid curves and an ergonomic hand-feel that's second to none. But for all their similarities in quality, materials and aesthetics, both knives bring their own unique capabilities and strengths to the table, as well. Take the machete; bursting at the seams with raw power and strength, this formidable barong makes quick work of even the most demanding jobs. Bitter serrations along the spine expand its utility well beyond that of the typical machete. The craggy sawback is perfect for ripping through tough materials like wood and rope fiber. 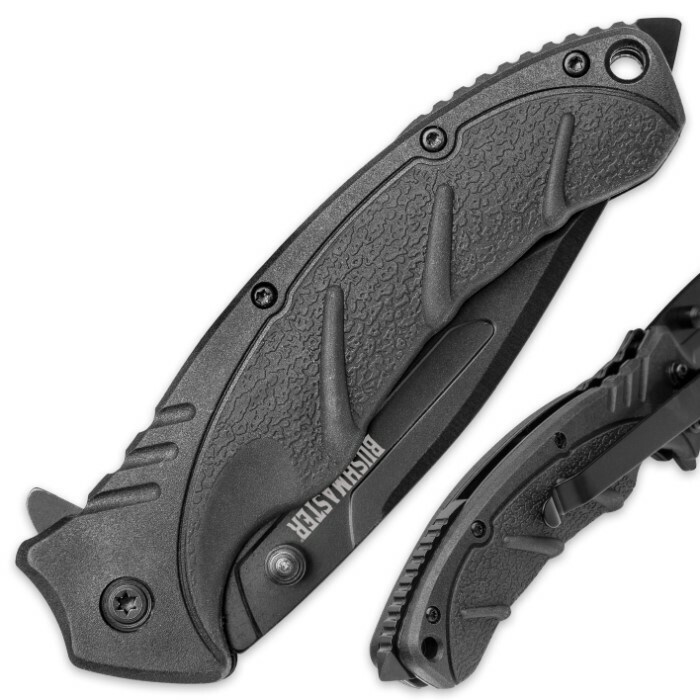 The folder offers fast, one-handed blade deployment via the smooth assisted opening mechanism and the ability to tackle a wide range of everyday jobs. 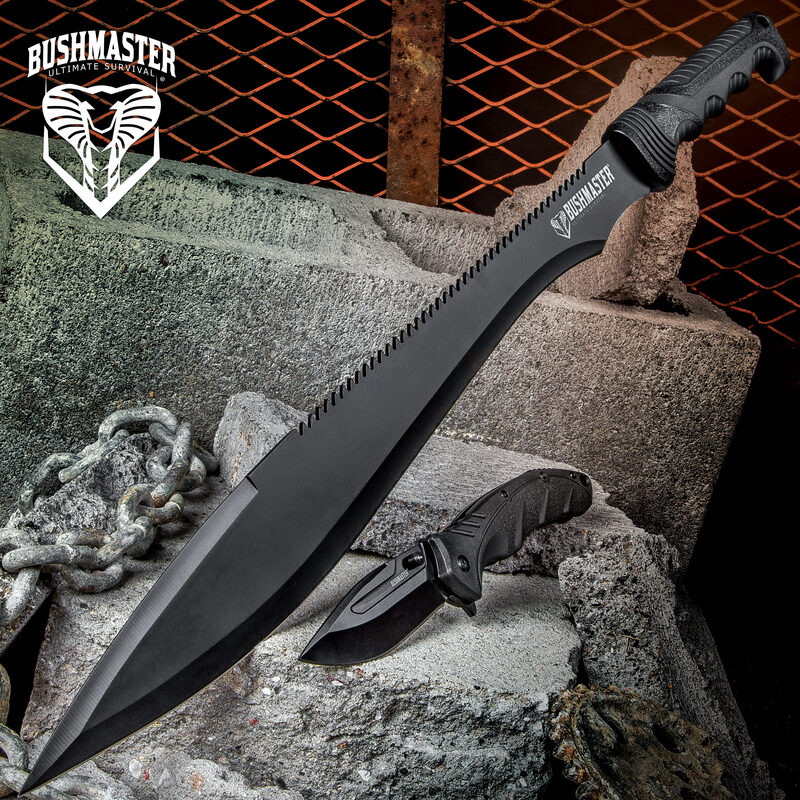 From the "ultimate survival" experts at Bushmaster, the Cobra Strike Set is designed specially to tackle the rigors of back country adventures and harrowing tactical scenarios. Don’t venture into the wild unknown without these black Bushmaster beauties by your side! Also great for farm chores, yard work, hunting, fishing, everyday tasks and much, much more! I mainly bought this set for the machete but the knife was a nice bonus. I had been looking for a machete with a pointy tip because every once in a while I need to use it as a light pry bar. This machete is strong enough for that and more then fits the bill for its intended purpose of whacking vegetation. Both the machete and knife came very sharp out of the box. Would highly recommend. I own the USMC version of this set. It is well worth the price I paid for it. I did not get my set on sale! I put a folded piece of plastic in the sheath, since it did not come with a liner(IT SHOULD). I knew that if I didn't, the sheath would be destroyed fairly quickly, since that exact thing happened to a Cold Steel sheath that I held wrong & cut through the sheath & cut my hand too! That is the only complaint I have with the set. Hey BudK team! This was my last received---but one of my FAVES---since I had to cancel my 'script. The macheté is super sharp. It's so sharp in fact that when I pulled it out in an arcing motion, it totally sliced my sheath down to the middle. I put a thick seam of Epoxy and clamped it, so that it still works and is probably stronger. But, the little knife is awesome, too. 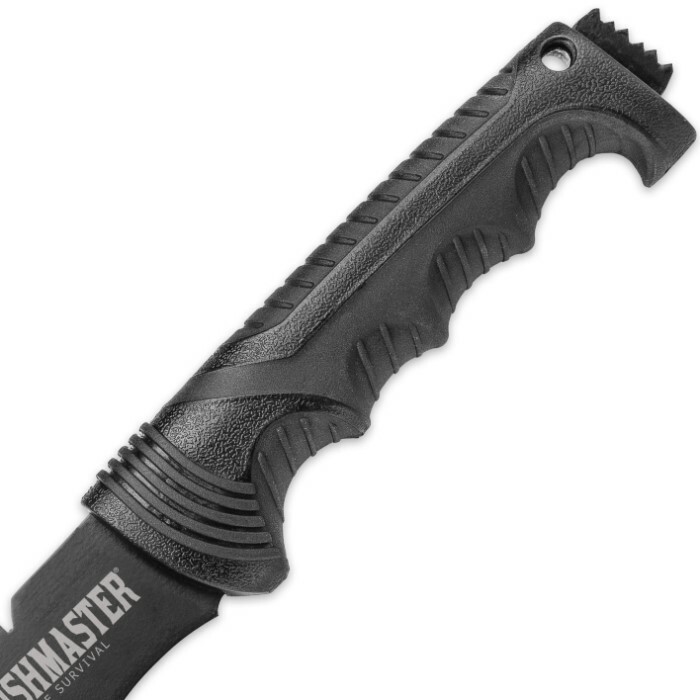 I often carry my BearOps/Blade Runner HQ, so I use the Bushmaster mini-tac knife as a 2ndary knife. I have yet to take either out into the wilderness. But, it looks like this macheté could be used to kill a BEAR in one swat! Or let it impale himself on it! Awesome knife set---but, a genuine leather sheath would be the NEXT thing to invest in, fellas. Thanks BudK. Stay sharp! There is no mention of what type of stainless was used in this knife set. It does seem to be a softer steel compared to the last KOTM I received. The assist on the pocket knife works flawlessly, the blade is not centered and almost rubs against the inside of the knife. I'm also on the list of "got this for KOTM", and holy crap. This knife subscription service is the best thing I've ever done. At first I was so confused by what I got, but after opening the box..I LOVE IT! It's absolutely beautiful. Sharp as can be, and looks flawless! I also love the assisted opening knife we got. That was a nice surprise, and as someone who always takes a pocket knife with him, this is my new #1. Very sharp and easy to get open. This is this month's KOTM and all I can say is thank you BudK!